An area rug can do more than just tie a room together. It can provide extra warmth and comfort in a room where you're likely to spend a lot of time. It can even be considered a safety feature as a rug can create more friction in a room (decreasing the odds of a nasty fall). Keep these tips in mind if you're shopping for the perfect new accent piece for your home. 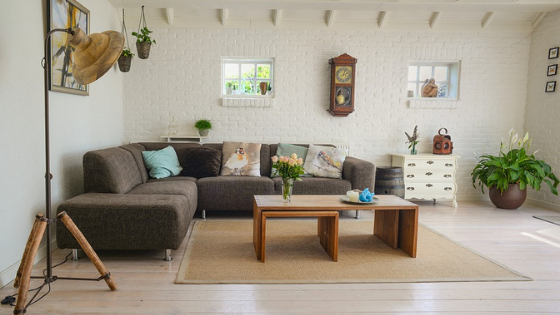 Tradition dictates that you find the size of your rug by measuring the seating area of a room and then rounding up in size. You're essentially trying to get all of the furniture in a cohesive space so everything looks organized and inviting. But rules were made to be broken once you understand the principles behind them. Modern looks will leave room for just the front legs of the furniture. Rugs may even be used as a pure focal point with no furniture on top of them at all. Putting an area rug in the kitchen is a great way to guard against the slippery tiles. It can even give your lower back a break because your feet are more supported on a rug than on hard flooring. Place a colorful rug or runner with a slip-resistant backing near the sink or stove and about six inches away from the cabinets. Skip the traditional mat in the bathroom by buying a colorful rug to put in front of the tub. A rug underneath a dining room table or in front of the bed can serve as an accent piece that will instantly liven up your rooms — even if the room already has carpet. If you're looking for an area rug in the entryway to protect the carpet underneath, choose one that's wider than the doorway so there's plenty of room for people to come in, take off their gear and stay a while. Chicago apartments can be chilly in the winter, which is why rugs are a must to inject a little warmth. If you're looking for a new place to call home, consider calling Cobbler Square Lofts to get the comfort and luxury you deserve.